On October 10 – 11, technologists, entrepreneurs, and innovators across the public and private sectors participated in the first Civic Hardware Hackathon for Disaster Preparedness in support of the White House Innovation for Disaster Response and Recovery Initiative. Co-hosted by the Department of Homeland Security Science and Technology Directorate, Federal Emergency Management Agency (FEMA), The Feast, IDEO, and Intel, the two-day event focused on creating and refining solutions to empower the disaster resilience community and survivors with critical information and resources. First announced by DHS S&T at the White House Innovation for Disaster Response and Recovery Demo Day on July 29, the Civic Hardware Hackathon was held in Red Hook, Brooklyn – a neighborhood still rebuilding from the impacts of Hurricane Sandy in October 2012. From the start, the hackathon organizers shaped the interaction to enable collaboration and to strengthen participants’ insights about end-user needs. After a series of introductory conference calls where civic hackers shared their project goals and challenges, the participants convened Friday morning at the Pioneer Works Center for Art and Innovation in Red Hook. 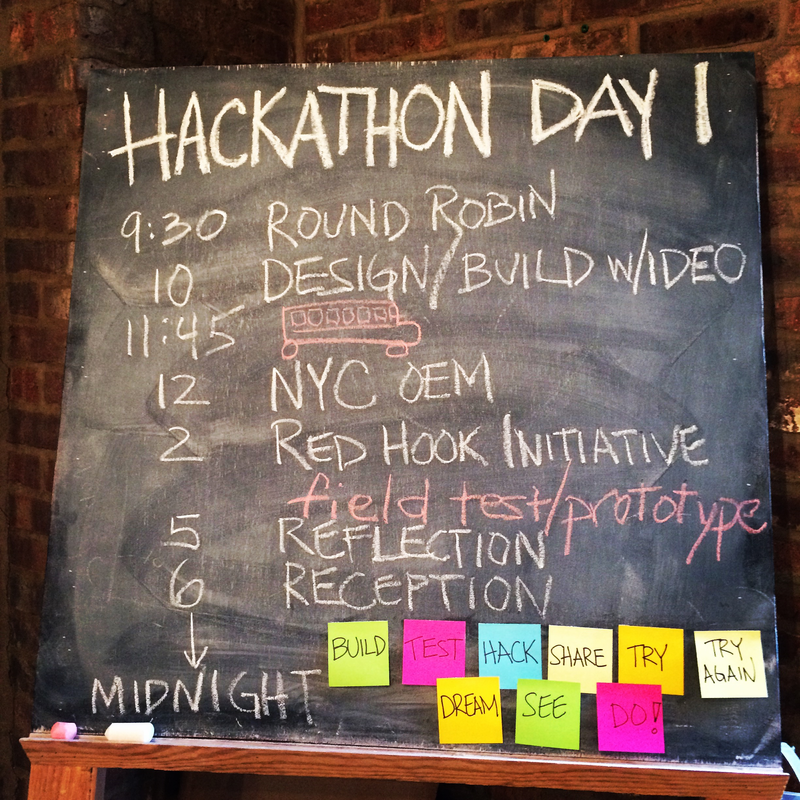 The hackathon included a Human-Centered Design workshop, a visit to the New York City Office of Emergency Management (NYC OEM), and field testing with volunteer first responders at the Red Hook Initiative (RHI). The Civic Hardware Hackathon included hands-on workshops, a visit to the New York City Emergency Operations Center, and field testing with volunteer first responders at the Red Hook Initiative Community Center. 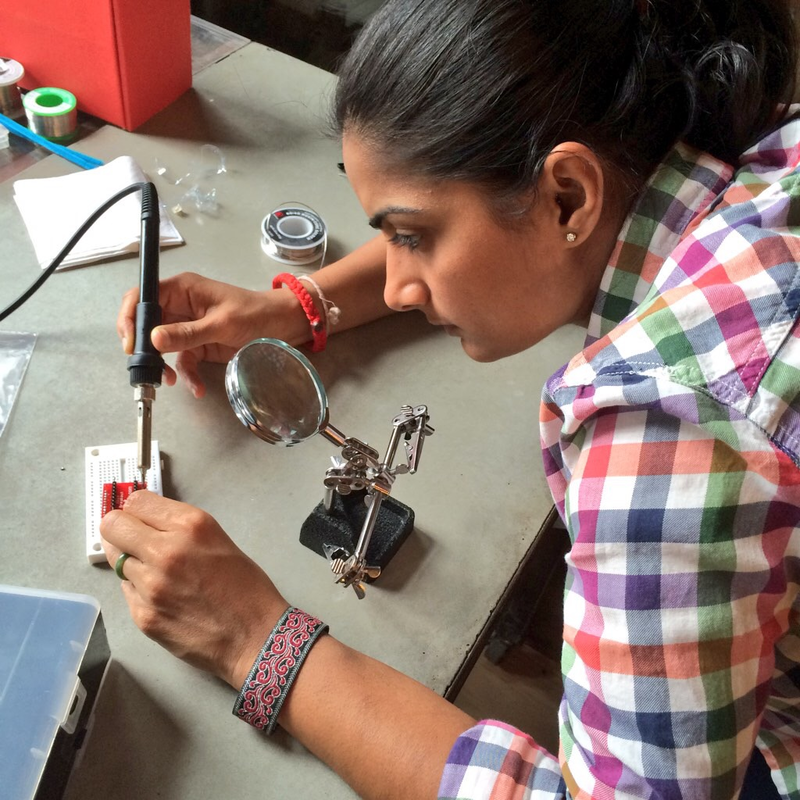 Soldering stations were used to prototype sensors and other devices. 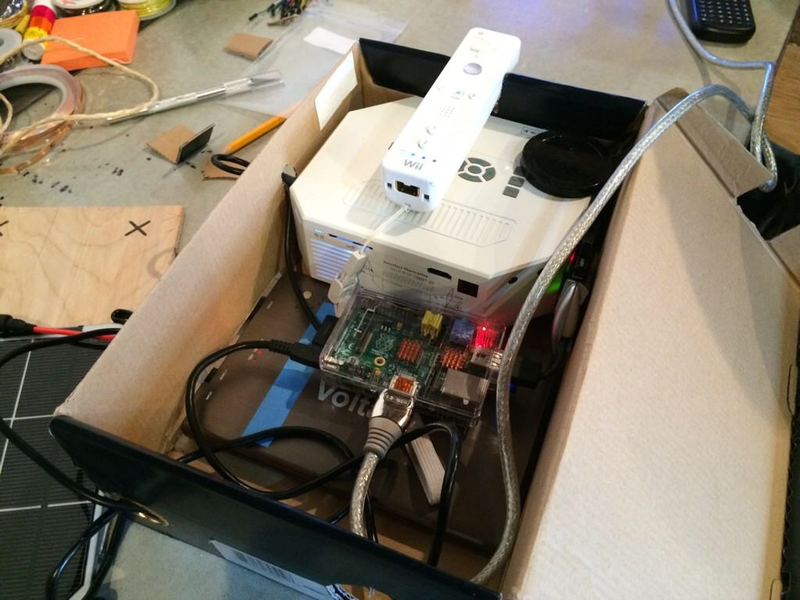 A “pop up” classroom built in a shoebox for the hackathon. 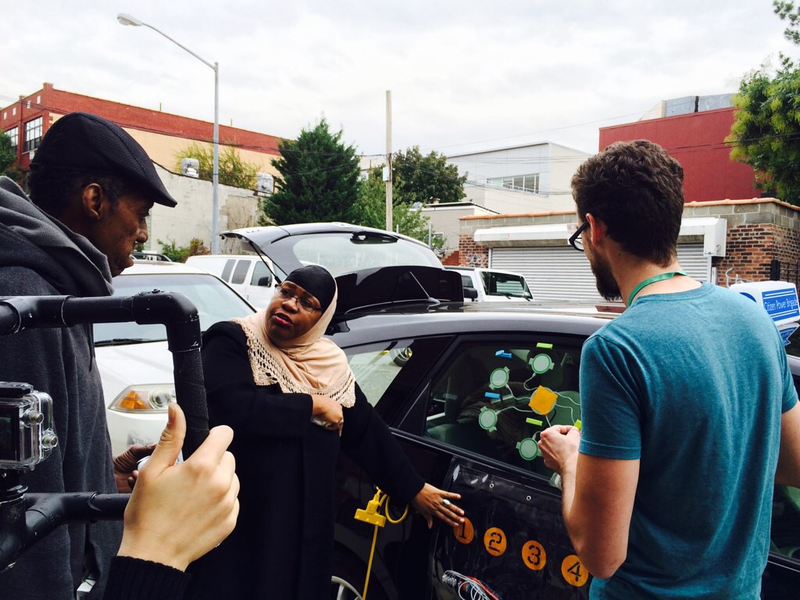 A Red Hook Initiative Local Leader and Emergency Medical Technician shares the Civic Ninja “Citizen Power Brigade” prototype with neighbors during the hackathon. The Civic Ninjas team started a new “Citizen Power Brigade” project for this hackathon to transform a hybrid electric vehicle into a clean and fuel-efficient source of mobile emergency power. Their prototype charged up to 100 phones simultaneously, and was demonstrated at over 3 locations in Brooklyn during the hackathon. In one week with a single tank of gas, one hybrid car can charge 8,400 phones, providing 12 million minutes of talk time for disaster survivors or providing emergency power to run appliances such as refrigerators. The RHI Digital Stewards, a group of 19-24 year olds who install, maintain, and promote the Red Hook Initiative community wireless network, worked over the weekend to make their WiFi infrastructure more resilient. The Digital Stewards collaborated with other hackathon participants to prototype solar power stations and new synchronization features. The Cascade Designs, Inc. team gathered feedback for their Clean Water STEM (Science, Technology, Engineering, and Math) Education project, aiming to improve hands-on science learning while pre-positioning water treatment devices in schools across the country for disaster preparedness. The water treatment device they shared can generate enough chlorine from table salt and a rechargeable car battery to treat a 55-gallon barrel of water in 5 minutes. HeatSeekNYC, a team aiming to tap into the Internet of Things to diagnose problems in heating systems and empower landlords and tenants to keep the heat on responsibly, built off their recent NYC Big Apps and September NY Tech Meetup awards, creating 14 prototype sensors at the hackathon and collaborating with other teams. LDLN (pronounced “Landline”), utilized the event to share their off-the-grid communications network that employs Raspberry Pi hubs and an App interface to help disaster relief workers relay their field data without the need for a cell, satellite, or internet connection. The team’s initial prototype was created last year in the NextDayBetter Typhoon Haiyan Relief Hackathon, and they were able to enhance their project at the Civic Hardware Hackathon by increasing the communication range, building a 3D-printed case, and integrating a GPS auto-locator. Eskuwela Now, inspired to get students and families back to their school routines after a disaster, built a “pop up” classroom in a shoebox. The team created a multi-touch smartboard with a Wii remote, projector, infrared pen, and Raspberry Pi, allowing educators and communities to set up a classroom for 10% of the cost of a typical smartboard. ChatPoint brought together off-the-shelf hardware that runs on a battery pack to prototype a WiFi chat base station that pairs with a smartphone app. To increase the communication range to reach several miles, the team looked to use a remote control helicopter backbone. The Pedal Power project created a cost-effective, portable means for converting mechanical energy to charge USB devices. The prototype utilized a hacked drill, IKEA hanger, wood scraps, a circuit board, and duct tape to let event attendees charge their phones with their hands and feet. In addition to these teams and the event co-hosts, participants included The Rockefeller Foundation, National Aeronautics and Space Administration, Environmental Protection Agency, Millennium Challenge Corporation, SparkFun Electronics, littleBits, 3DSystems, Microsoft, DoGoodBus, NYC OEM, RHI, and the American Red Cross. Coverage of the event can be found by following the hashtag #disastertech on Facebook, Twitter, Instagram, and other social media outlets. In addition, The Rockefeller Foundation has sponsored a platform, Feast Connects, to enable continued collaboration. Participants will be able to share ideas, open source code, data, and open hardware designs to allow the community to build on progress made at this year’s event. Meredith Lee is AAAS Science and Technology Policy Fellow at the U.S. Department of Homeland Security Science and Technology Directorate. Rafael Lemaitre is Director of Public Affairs at the Federal Emergency Management Agency. Brian Forde is Senior Advisor to the U.S. Chief Technology Officer at the White House Office of Science and Technology Policy.